Your license alllows you to install and run Mailtraq on one computer, plus one inactive 'backup' copy. The licence will allow you to move an installation between two machines without loss of service. When moving Mailtraq it is important that the new installation and the old installation are both using the same build of Mailtraq and are working under the same Database format. We recommend that all installations now use the AFX Database format. Note that the default Database that Mailtraq installs has changed. What Database are you currently using? Click here to find out. Go to https://my.mailtraq.com and download a copy of the latest version from your account. Install this on the new machine using the original Installation Id. During the new install process you will be asked which database to use. The default is AFX - see step 6 below. Do the minimum to complete the installation wizard. On the old machine - make sure you have upgraded to the same version and Database format and then shut Mailtraq down. Take a copy of the Mailtraq Database folder. Substitute the copy of this Database folder from the old machine for the same folder on the new machine. Shut down the old server and disconnect from the network*. You should archive the original 'safety' Database backup for the time being. Mail usually flows following the local static IP address or machine name, so if you set the local Static IP address or machine name on the new machine to that of the old machine now removed from your network, messages should flow automatically to the new installation. Remember that you must not have two machines with the same address on the network, so be sure the old machine is disconnected. *It is a good idea to give it a new name/IP address before disconnecting - just in case it gets inadvertently reconnected in the future. Note the trailing \ is used. however if you need to move the Database to a new drive then this is the recommended procedure. Mail servers do a lot of writing to the database - typically several million I/O writes a day. The best place for Mailtraq's database to be is on the same drive that the Program is installed onto, the default is C, but it can be any local drive, however it must be an internal hard-drive to the machine. The only type of external drive that is suitable is one with an eSATA connection (example). Use the Mailtraq Configuration panel (Windows Start Menu | Mailtraq) to Stop the Mailtraq Service. Next, Copy the database folder to the new location following the 'suitable drive' advice above. 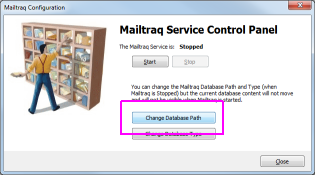 Use the Mailtraq Configuration tool to tell Mailtraq the new location at [Change database path]. Start the Mailtraq Service, and then either archive or discard the old database folder. Rename the original Database folder to 'Databaseold'. This folder may be deleted after the move is complete: meanwhile it serves as a 'safety backup' in case you make an error. Uninstall Mailtraq from the machine using the Windows Control Panel, Add & Remove Programs. 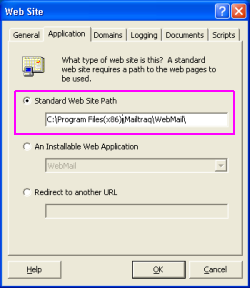 Run your Mailtraq Setup program: select the custom option to change location of the program. After the program installs - Mailtraq will ask you if you wish to create a new Database or browse to an existing Database. Use the browse option to the file \database\configuration\system and complete the installation wizard. Mailtraq will restart using the Database in the new location. No reconfiguration is necessary. You may archive or discard the 'safety' Databaseold backup. If you are using the older Traditional version of Mailtraq (2.15 or below) we recommend first upgrading (see how) to the current Release version of that Mailtraq and then transitioning to the MMC/WiX Console version (see how) before moving Mailtraq. Mailtraq 2.16 introduced the MMC console using the WiX installer (read more) which is suitable for use on all current versions of Windows. The Traditional version of Mailtraq is not suitable for use with Windows 7, Vista or Windows Server 2008. You may then move Mailtraq by following the above procedure. 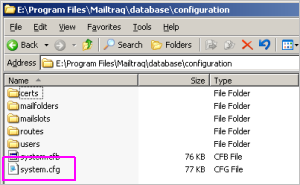 Mailtraq places its 'Temp' files in the temporary directory associated with the user account under which it is running. If you run Mailtraq as a user, it will be the user's temporary directory (%USERPROFILE%\Local Settings\Temp). Mailtraq normally runs as a service under the System-user. Bring up Explorer, right-click on "This PC", and select Properties. This opens the dialog-box you need to make the changes in. You may wish to change both User and System locations.